Join the discussion on our forums! 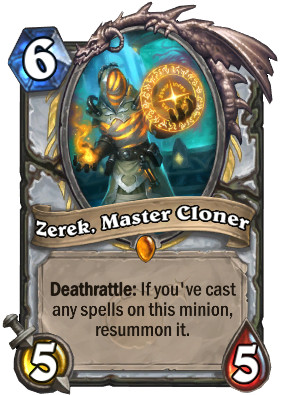 Come discuss Zerek, Master Cloner over in our dedicated Zerek, Master Cloner discussion topic. This is my favorite card from Boomsday project and my first legendary of this set. Very good card , stat wise and deathrattle is solid. Damn I need this card so oo much. I think even Cairne is better. However, I got this as my free legendary, so I'm not considering dusting it yet. Maybe in the future, it becomes a good card. its not incredibly weak to silence? its still a plain 5/5 if you silence it. thats considerably better than a card like Tar Creeper which loses its purpose or a card like Carnivorous Cube which loses the 2 resummoned minions, especially if all you used on zerek is something like a Power Word: Shield. edit: because you can also summon multiple copies with cards like Vivid Nightmare your opponent would have to use a bunch of silences to clear every zerek which is undoable without Mass Dispel really. You really don't need Vivid Nightmare or many buffs to make it work! I've been running Egg Priest utilizing Zerek, and he works wonders with Twilight's Call. The only buffs I use are Power Word: Shield, Topsy Turvy and Unidentified Elixir (and Shadow Visions too, ofc). It's really fun and honestly seems really powerful. One of the best looking golden cards in the whole game. 11/10. One thing I'm wondering about this card is how he interacts with The Lady in White. Yes he won't change stats at all if he's in the deck when she's played, but her effect specifically states "Cast 'Inner Fire' on every minion in your deck" . How this sounds to me is that technically, this guy will have had 'Inner Fire' cast on him from her effect, so should he then spawn a copy of him when he dies? Since the 'Inner Fire' effect is from a minion I feel like it might not work, but she also says Cast, which makes me think it might work. I'll be testing this once the set drops, but I'm wondering if anyone else was wondering about this interaction. Oh yeah, guess I should've noticed that earlier. Thanks for pointing that out... Now I feel silly for not noticing the wording when I first thought of this idea. Works with a mere 1 mana spare part! Think ur better off playing Carine. The extra attack is not worth the extra condition. I like the art and, as usual, I'll craft it to play a Priest deck that doesn't win much. Might even pair it with his Cloning Gallery. you don't draw zerek and lose the game. I feel like people always forget that Twilight's Call exists when talking about this card.